How do medications and alcohol affect snoring? What are different levels of snoring? How is it determined if snoring is a medical problem? What are some objective tests to measure sleepiness? What are some non-surgical treatments for snoring? What are the surgical options for snoring? What is the success of surgery for snoring? Treatments for snoring are both nonsurgical and surgical. While we are breathing, air flows in and out in a steady stream between our nose or mouth and our lungs. There are relatively few sounds when we are sitting and breathing quietly. When we exercise, the air moves more quickly and produces some sounds as we breathe. This happens because air is moving in and out of the nose and mouth more quickly and this results in more turbulence to the airflow and some vibration of the tissues in the nose and mouth. For breathing at rest, it is ideal to breathe through the nose. The nose acts as a humidifier, heater, and filter for the incoming air. When we breathe through our mouth, these modifications to the air entering our lungs occur to a lesser extent. Our lungs are still able to use the colder, drier, dirtier air; but you may have noticed that breathing really cold, dry, or dirty air can be uncomfortable. Therefore, our bodies naturally want to breathe through the nose if possible. The nose is made up of two parallel passages, one on each side, called the nasal cavities. They are separated by a thin wall (the septum), which is a relatively flat wall of cartilage, bone, and lining tissue (called the nasal mucosa). On the lateral side (the wall of the nose closer to the cheeks) of each passage, there are three nasal turbinates, which are long, cylindrical-shaped structures that lie roughly parallel to the floor of the nose. The turbinates contain many small blood vessels that function to regulate airflow. If the blood vessels in the turbinates increase in size, the turbinate as a whole swells, and the flow of air decreases. If the vessels narrow, the turbinates become smaller and airflow increases. Almost everyone has a natural nasal cycle that generally will shift the side that is doing most of the breathing about every 2 to 6 hours. For example, if the right nasal turbinates are swollen, most of the air enters the left nasal passage. After about 6 hours, the right nasal turbinates will become smaller, and the left nasal turbinates will swell, shifting the majority of breathing to the right nasal passage. You may notice this cycle when you have a cold or if you have a chronically (long standing) stuffy nose. The turbinates may also swell from allergic reactions or external stimuli, such as cold air or dirt. As discussed above, we naturally want to breathe through our noses. Some people cannot breathe through their noses because of obstruction of the nasal passages. This can be caused by a deviation of the nasal septum, allergies, sinus infections, swelling of the turbinates, or large adenoids (tonsils in the back of the throat). 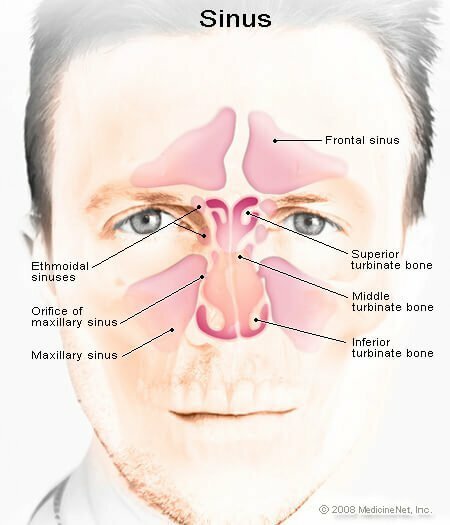 In adults, the most common causes of nasal obstruction are septal deviations from a broken nose or tissue swelling from allergies. In children, enlarged adenoids (tonsils in the back of the throat) are often the cause of the obstruction. People with nasal airway obstruction who must breathe through their mouths are therefore sometimes called "mouth breathers." Many mouth breathers snore, because the flow of air through the mouth causes greater vibration of tissues. The soft palate is a muscular extension of the bony roof of the mouth (hard palate). It separates the back of the mouth (oropharynx) from the nasal passages (nasopharynx). It is shaped like a sheet attached at three sides and hanging freely in the back of the mouth. The soft palate is important when breathing and swallowing. During nasal breathing, the palate moves forward and "opens" the nasal airway for air to pass into the lungs. During swallowing, the palate moves backward and "closes" the nasal passages, thereby directing the food and liquid down the esophagus instead of into the back of the nose. The uvula is the small extension at the back of the soft palate. It assists with the function of the soft palate and also is used in some languages (Hebrew and Farsi) to produce the guttural fricative sounds (like in the Hebrew word "L'chaim"). English words do not use the guttural fricative sounds. The palate and attached uvula often are the structures that vibrate during snoring and surgical treatments for snoring may alter these structures and prevent guttural fricative sounds. Therefore, if you speak a language that uses guttural fricative sounds, a surgical treatment for snoring may not be recommended or appropriate for you. After a night of heavy snoring, the soft palate and uvula may be swollen in the morning. Patients may experience an increased sensation of gagging in the morning until the swelling subsides. The tonsils are designed to detect and fight infections. They are located at the back of the mouth on each side of the throat (oropharynx). They are also called the palatine tonsils. Like other infection-fighting tissue, the tonsils swell while they are fighting bacteria and viruses. Often, the tonsils do not return to their normal size after the infection is gone. They can remain enlarged (hypertrophied) and can narrow the airway vibrate, and cause snoring. The soft palate, as described above, is the flap of tissue that hangs down in the back of the mouth. If it is too long or floppy, it can vibrate and cause snoring. The base of the tongue is the part of the tongue that is the farthest back in the mouth. The tongue is a large muscle that is important for directing food while chewing and swallowing. It also is important for shaping words while we are speaking. It is attached to the inner part of the jaw bone (mandible) in the front and to the hyoid bone underneath. The tongue must be free to move in all directions to function properly. Therefore, it is not attached very tightly at the tip or top of the tongue. If the back of the tongue is large or if the tongue is able to slip backwards, it can narrow the space through which air flows in the pharynx, which can lead to vibrations and snoring. Snoring sometimes can be the only sign of a more serious problem. People who snore should be evaluated to be certain that other problems such as sleep apnea, other sleeping problems, or other sleep related breathing problems are not present. If the snorer sleeps and breathes normally, then snoring is only a problem for the snorer's bed partner or family members. In fact, snoring often disrupts the sleep of family members and partners more than it affects the snorer. Frequently, partners of snorers report leaving the bedroom (or making the snorer leave the bedroom) many nights per week. Snoring may not be a medical problem, but it can become a significant social problem for the snorer and sleep problem for the bed partner. It is important to determine if snoring is related to an underlying medical condition or is an isolated (primary) problem (not associated with any underlying disease). More specifically, primary snoring is not associated with obstructive sleep apnea, upper airway resistance, insomnia, or other sleep disorders. This distinction is important because of the associated link between the underlying conditions and other adverse health effects. For example, obstructive sleep apnea (OSA) is associated with higher risks of cardiovascular disease such as heart attacks and strokes. This association is thought to exist because of higher prevalence of high blood pressure (hypertension) in individuals with obstructive sleep apnea. On the other hand, studies have shown that people with primary snoring did not have higher rates of elevated blood pressure compared to the general public. Despite this, there is increasing evidence of a relationship between snoring and other significant health problems. However, the exact cause of this relationship remains unclear. Mild resistance to airflow for any of the above reasons in the upper airways may result in some snoring that is not associated with any sleep disturbance. If resistance to airflow increases, the efforts to maintain adequate ventilation and breathing may cause transient arousal from sleep that is typically not severe enough to cause the level of oxygen in the blood to decrease (hypoxia). This is called the respiratory effort related arousal (RERA). When the resistance increases even further, the ventilatory efforts cannot keep up with the degree of resistance to maintain adequate levels of oxygen, and airflow decreases or stops. This often leads to a decrease in the level of oxygen in the blood. As a result, sleep becomes more fragmented and arousals more frequent. The events are referred to as obstructive hypopneas (reduced breathing) or apneas (absent breathing), and the condition is termed obstructive sleep apnea-hypopnea syndrome. To thoroughly evaluate someone with a snoring problem, it is important to also talk to that person's bed partner or family members. A complete history and physical examination is often performed. In addition, more detail about the snoring and sleep problems needs to be obtained. The patients may be asked about their sleep pattern and sleep hygiene, daytime symptoms of sleepiness, daytime napping, and frequency of awakening at night. A thorough physical examination may also be performed including assessing the patient's body weight and body mass index (BMI), assessment of the neck circumference (area around the neck), and visualization of the throat, nasal, and oral cavities to determine how narrow the oral and nasal passages are. People who sleep (or lie awake not sleeping) near a snorer often report signs that may indicate a more serious problem. Witnessed apnea (stopping breathing) or gasping can suggest a breathing problem (sleep apnea, see below) or resulting heart problems. Leg kicking or other jerking movements can indicate a problem such as periodic limb movement disorder or restless leg syndrome. Referral to a sleep specialist may be recommended if obstructive sleep apnea, restless leg syndrome, and periodic limb movement disorder are suspected. Multiple studies have shown that simple clinical evaluations cannot determine if a person only snores, or if he or she has a more significant sleep disturbance. Therefore, a sleep study is often needed to determine if obstructive sleep apnea is present prior to initiating any treatments. If someone's sleep is disrupted because of snoring, the person may also notice other symptoms. Frequently, people complain of difficulty waking up in the morning or a feeling of insufficient sleep. They may take daytime naps or fall asleep during meetings. If sleep disruption is severe, people have fallen asleep while driving or performing their daily work. A home (unattended) sleep study can measure some basic parameters of sleep and breathing. A pre-test evaluation by a sleep medicine specialist to determine if home testing is appropriate is recommended. Often, the home sleep study will include pulse oximetry (a measurement of the level of oxygen in the blood), a record of movement, snoring, and apneic (pause in breathing) events. A home study can prove that there are no sleeping problems or suggest that there may be a problem. Some types of home sleep studies may monitory blood vessel reactions or tone as well as detecting respiratory events. Improved technology has expanded the ability to perform testing in the person's own sleep environment. If a home sleep study suggests a problem, treatment is often initiated. If the results are not clear, repeat testing with a full sleep study (polysomnography) may be performed in a clinic. (For a complete description of a full sleep study, see below). If the sleepiness inventory and sleep study suggest there are no sleeping or breathing disorders, a person is diagnosed with primary snoring. Treatment options then can be discussed. For someone who reports being sleepy during the day, it is sometimes helpful to measure how sleepy he or she is. Also, after treatment of sleep problems, we sometimes want to measure improvement in daytime sleepiness. Sleepiness can be measured with a Multiple Sleep Latency Test (MSLT). Basically, the MSLT measures how fast someone falls asleep during the day. It must be done after an overnight sleep study (polysomnography) has documented adequate opportunity for sleep the night before and no untreated obstructive sleep apnea. The test is composed of four to five "naps" that last 20 minutes each and are spaced two hours apart. The person is instructed to "try to fall asleep." The average time to fall asleep is calculated for all four or five tests. A normal time would be greater than ten minutes needed to fall asleep. Excessive sleepiness is defined as falling asleep in less than five minutes. The Maintenance of Wakefulness Test (MWT) also measures daytime sleepiness. The person taking this test is instructed to "try to stay awake." This is repeated for four 40-minute sessions, two hours apart. Not falling asleep in all four tests is the strongest objective measure of the absence of daytime sleepiness. Some businesses use these tests to ensure that their employees are not excessively sleepy while at work. Specifically, airline pilots and truck drivers who experience sleepiness need to have a test to ensure public safety and productivity at work. Unfortunately, there is no test that will guarantee that someone will not fall asleep at his or her job or while driving. The goals for the treatment of snoring may be difficult to determine. The problem of snoring usually is a problem for the bed partner or roommate. Therefore, successful treatment should also include the goal of achieving a successful night's sleep for the bed partner or roommate. This makes treatment of snoring a challenge. For example, someone may have a successful treatment if his or her snoring decreases from a jackhammer level to that of a passing truck. If their bed partner is happy, then the snoring problem is "cured." However, another person whose snoring decreases from a mild sound to the level of heavy breathing may still have an unhappy bed partner. Most procedures to treat snoring are focused on reducing the flutter or movement of the soft palate (roof of the mouth). This addresses palatal flutter snoring. If the snoring originates from behind the tongue or from the lateral walls of the throat, palatal procedures will be less effective. It is wise to look at the "success" reports for various treatments with a critical eye. If the number of nights that a bed partner has to leave the room decreases from seven nights per week to one night per week, is that success? Some would say that it is. However, the bed partner (or snorer) still has to leave the room one night per week. It is important to know what the expectations for a "cure" are before considering any treatments. Behavioral changes are the easiest to identify, but some of the hardest to accomplish. For example, if a person gains 10 pounds, snoring may become a problem. It is easy to tell a person to lose the ten pounds, but it is difficult to accomplish. Behavioral changes include weight loss, changing sleeping positions, avoiding alcohol, smoking cessation, and changing medications that may be the cause of snoring. Losing weight may improve snoring. Snoring usually is worse when lying flat on the back, as discussed previously. To help this problem, a pocket can be sewn into the back of the snorer's pajama tops. A tennis or golf ball in the pocket will "encourage" the snorer to roll over to sleep on his/her side. Special sleeping pillows to prevent sleeping on the back are also available. Alcohol or sedative medications make snoring worse, and therefore should be avoided. As previously discussed, snoring can be exacerbated by normal airflow through a narrowed area in the throat. Part of the narrowing is caused by the tongue and palate falling backwards during sleep. Some dental devices have been developed that hold the jaw forward. Since the tongue is attached in the front to the jaw, the tongue also is held forward when these devices are used. Some devices are designed to hold the palate up and forward. Dental devices (similar to a mouthpiece) may also be referred to as oral appliances or mandibular advancement devices. The devices are best made by a dentist or experienced physician to ensure a correct fit without causing problems and adequate treatment of the sleep problem. These devices may improve snoring in 70% to 90% of cases. There are some drawbacks to dental devices, however. They must be worn every night in order to work, can cause or exacerbate temporomandibular joint (TMJ) problems, can cause excessive salivation, and can be moderately expensive. The available data on some of these devices revealed both subjective and objective improvement in snoring. These devices may be appropriate and recommended for those individuals with primary snoring or mild obstructive sleep apnea who did not benefit or did not qualify for the previously discussed behavioral changes. For people with narrow nasal passages, snoring can be alleviated with nasal devices or medications. Breath-rite strips open the anterior nasal valve (front part of the nose). If this is the main or only area of narrowing, snoring may improve with use of these strips, but this is frequently not the case. If nasal mucosal (lining) swelling from allergies or irritation is causing the problem, nasal sprays may help. Nasal saline irrigation spray is a way to clean and moisturize the nasal lining since environmental irritants that stay in the nose (dust, pollen, and smoke) continue to irritate as long as they are present. The nasal lining also swells when it is cold and dry. Nasal saline helps to wash away irritants and moisturizes the mucosa without side effects. Other nasal sprays that may be used to improve nasal breathing include nasal steroid sprays and nasal decongestants. They are very helpful for swelling due to minor allergies or irritation. Steroid sprays decrease inflammation in the nasal passages. Very little of the steroid is absorbed into the body from the nose so there are few side effects with these sprays. Nasal decongestants that shrink the blood vessels in the turbinates also can be used to improve snoring that results from nasal congestion. These measures may also be helpful for people who only snore when they have upper respiratory infections or colds, which typically cause swelling of the airway passages. CPAP or continuous positive airway pressure is a device that is commonly used in patients with a clinical diagnosis of obstructive sleep apnea. This device works by providing a constant, increased air pressure to prevent airway narrowing during inspiration and expiration. It entails wearing a mask that is connected by tubing to a pump that keeps the pressure of the inspired air at a higher than normal level. This device has proven to cause subjective and objective improvement of snoring and other symptoms of obstructive sleep apnea. The air pressures are adjusted individually for each patient based on the parameters of a sleep study. The main problem with CPAP is that it has to be worn to be effective. The machines are smaller and have enhanced features along with a wide variety of mask interfaces to improve comfort and compliance. Despite this, patient adherence to the use of CPAP often is not optimal. There are many other simple over the counter products available to help with snoring. Generally, they may not be scientifically studied and recommended. They may be useful in some people subjectively, but night to night variability in results has also been reported. Regardless, if snoring exists, then it needs to be fully evaluated by a physician to assure that there is no underlying potential medical condition and to choose a proven method of treatment. Surgery to treat snoring is designed to reduce obstruction or narrowing in the anatomic area that is causing the snoring. There may be more than one involved area, so surgery on only one of the narrowed areas may decrease snoring but not eliminate it entirely. Decreasing palatal and uvular flutter are also believed to help in reducing the snoring sounds. Surgical treatment of snoring is generally focused on the nasal passages, palate and uvula, and tongue. Most of the surgical procedures are performed in a doctor's office. In general, individual insurance carriers determine what medical conditions are covered as a benefit of the plan. Insurance is frequently changing, and, therefore, coverage policies may vary. As always, it is important to check with your own insurance carrier and pre-confirm the estimated cost and coverage for any planned medical treatment or surgery. It is prudent to undergo a formal sleep study (polysomnogram) prior to performing surgery to assure that snoring is not a manifestation of obstructive sleep apnea. If sleep apnea is the case, then more conservative CPAP needs to be prescribed and attempted first. In addition, if snoring is associated with obstructive sleep apnea, then a surgical correction may mask the obvious symptom of a potentially serious condition and leave sleep apnea undiagnosed. Nasal surgery to treat snoring is generally focused on improving a narrow nasal passage. While improvements in snoring may occur after improvements in nasal breathing, some studies have not shown this to be the case. In the doctor's office, radio-frequency energy can be used to shrink the turbinates by creating scar tissue in them, resulting in a more open nasal passage. The procedure takes about 15 minutes. Most of that time is spent numbing the nasal tissue with topical and injectable medications. The procedure is performed with a wand that is placed into the tissues. Radio-frequency energy then is released into the tissues for about ten seconds. Several applications are done on each side of the nose for maximal effect. The procedure is successful when scar tissue forms. Therefore, it takes about three months to see the full effect of the procedure. As the scar tissue softens over time, however, the swelling and narrowing may recur. The procedure then can be repeated as needed in the office. Several other anatomic problems can cause or worsen snoring. The nasal septum is the "wall" in the center of the nose that separates the right and left nasal passages. After trauma (including during birth), the septum can be deviated to one side or may curve to both sides (one side by the front of the septum and the other by the back of the septum). The septum deviation can be corrected by removing the crooked cartilage. This surgery usually is performed in the operating room under general anesthesia. After surgery, if the nasal obstruction is improved, the snoring often improves. Nasal polyps are mucosal "growths" in the nose that are usually caused by allergies. As they continue to enlarge over time, they can cause nasal obstruction. If the polyps are large enough, they will require surgery to remove them. This surgery was previously performed in the doctor's office. However, it is currently more usual to perform the surgery in the operating room under general anesthesia. Removing the polyps reduces nasal obstruction, which may improve snoring. Snoring can also be caused by a long, floppy palate and uvula. There are several procedures that involve the uvula and palate. Some procedures remove the tissue whereas others try to stiffen the tissues. Because the procedures are performed on soft tissue, over time the tissue stiffening can soften. As a result, a reduction in the effect may occur. Uvulectomy is the removal of the uvula. This can easily be performed under local anesthesia in the doctor's office. A person usually does not miss having the uvula. However, there is a period of one to two weeks of discomfort in the throat after the procedure. Some people require strong pain medications for several days, whereas others need only acetaminophen (Tylenol) or an over-the-counter equivalent. Most people describe the pain as similar to a bad viral sore throat that is worse when swallowing. The main risks of uvulectomy are pain, bleeding, and altered speech (if you speak a language with guttural fricatives like Hebrew or Farsi). Laser assisted uvulopalatoplasty (LAUP) is an older procedure which involves trimming the palate with a laser. It can be performed in the doctor's office under local anesthesia. Small cuts are made in the palate on each side of the uvula with a laser. Several procedures are usually needed for a maximal effect. The scarring caused by the procedure stiffens the palate, decreasing the ability of the palate to vibrate and pulls the palate sideways to tighten it. This procedure results in moderate pain for one to two weeks that is generally controlled with oral pain medications. Other methods to stiffen the palate in the office include injections with a sclerosing agent, radiofrequency ablation of the palate, cold ablation of the palate, or in-office palatoplasty procedures. Snoring due to a long, floppy palate can be treated with office procedures that stiffen the palate. Like a sail on a sailboat, the air moving around the palate can cause vibrations of the tissue. For a sailboat sail, battens are placed to stiffen the sail and decrease vibration. Similarly, a stiffer palate vibrates less. The palate can be stiffened by creating scar tissue (as discussed previously) or with implants. Radio-frequency ablation of the palate can be performed under local anesthesia in the doctor's office. Usually, three tunnels in the tissue are made with a radiofrequency wand. The radiofrequency energy is applied for approximately ten seconds with the wand in the palate muscle tissue. The tissue heals as scar tissue, and the palate becomes stiffer and vibrates less. Generally, scar tissue in the palate continues to form for up to three months. Up to 77% of people report reduced snoring after this procedure, however, as the tissue continues to heal over time, the palate may soften and re-obstruct. One study demonstrated a 29% relapse in snoring after one year. Palate implants are now being used to treat snoring. They are made from Dacron, which is a non-reactive material that has been used for many years for heart valve surgery and hernia repair. Dacron also encourages the normal tissue to grow into it. Small Dacron implants are placed into the palate under local anesthesia. The implants stiffen the palate just like scar tissue does after radiofrequency treatments. The implants stay in the tissue, so recurrence of snoring should be reduced. Correct patient selection is important. The placement of the implants is done near the posterior edge of the hard palate. If the patient has a long, floppy, soft palate and uvula, there may be a lower likelihood of successful reduction in snoring. Multiple implants can be placed, with additional implants added up to a total of 5 in some cases. Some relapse after 12 months was common in many studies, and no significant reduction in obstructive sleep apnea has been shown with any consistency. There is a small increased risk of infection after insertion of foreign material in the palate tissue. If this occurs, the implant should be removed and replaced with another implant. Although this sounds like a negative consequence, infection actually leads to scarring, which helps decrease the vibrations of the palate. The implant procedure results in less tissue inflammation and therefore the procedure does not hurt as much or for as long as following radio-frequency treatments. Surgeries are generally successful in reducing snoring. The success of a procedure depends on the problem area causing the snoring. For example, someone with nasal congestion will not have much improvement with a palate procedure and vice versa. The other factor that makes success hard to measure is the definition of success. As discussed earlier, the goal of surgery should include a successful night's sleep for those around the snorer. Palate implant surgery has been reported to decrease snoring. On a loudness scale of 1 to 100, the average decrease is from 79 to 48 at three months. Is a snoring level of 48 a success? For some people it may be, but for others it may not. Similarly, palate implant surgery was recommended by 89% of snorers, but only 69% of their partners. Palatal implant surgery, like other surgeries, is very successful if the patients are carefully selected. Only people with snoring due to palate problems will improve with palate surgery, and only the snorer's partner will determine if the improvement in snoring is a "success." Sankar, Veena, MD. Physiologic Approach in Snoring and Obstructive Sleep Apnea. Medscape. Updated: Aug 01, 2017.